Having funeral catering delivered helps take a weight off your mind. Whether it is to someone’s house, a church hall or another venue, all professional caterers should offer a delivery service at such a sad time. With lots of other things to sort out the delivery of the food should be one less thing to worry about on the day of the funeral. Prior to the day however you should be wise when picking your catering options, a major hiccup is the last thing you want on such a day. 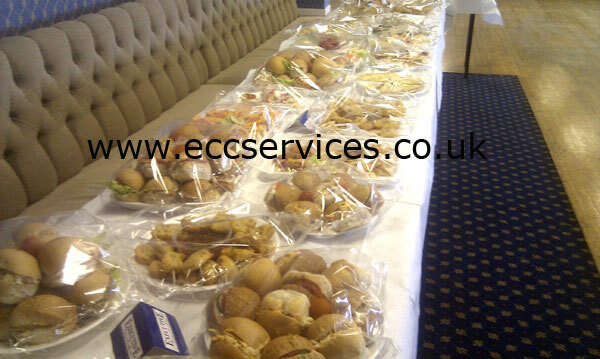 As well as delivering, professional catering companies set up the buffet for you so everything is in place after the ceremony. If required some even offer a waiter/ waitress service if required, however this does usually cost a little more money. Most catering firms have their own funeral menus already established, these help choosing catering a whole lot easier. However the choice of food is down to personal preference. The number of guests expected might help determine what to include. Mini buns - small white and brown bread buns again filled with a range of tasty meat and vegetarian fillings. Pies - whether its steak, mince or cheese and onion, pie is another funeral buffet food that will be a hit with guests of all ages. Whatever options you choose for a funeral buffet remember to keep it simple and to try and cater for the needs of all your guests. If you are expecting vegetarians then try and cater for them too.